I first talked about Benjamin Hallatt's electronic noise on a spit he did as W>A>S>P>S with Nacht ind Nebel. He recently sent me another release, his first, from 2004 from SCKE which has been rereleased on KIKS/GFR Records. The thing for me about digital sound work like this is that it succeeds at using the medium in the way it was intended. Using a computer not to hide the imperfections of a performance but to chop up wave forms at any points on any level of zoom. The digital glitches that are still relevant today from the same period were from Oval, Aphex Twin or Squarepusher to name the obvious ones. All of a sudden it wasn't about the instrument doing the manipulation or an unintended malfunction it became about changing the way you hear things, like psych was trying to do. Once this heavy, impossibly processed rhythm was introduced it gave away how it was created and it wasn't hiding anymore. There's nothing more unnatural that says we have complete control over all sound and there's no going back. I like "Ornament #2"'s attention to detail in breaking these percussive sounds down into something else. Taking the very nature of a strike with a quick attack and trailing decay of room sound, bouncing off the space and chopping it up completely to a mere slice of that original sound. Grouping them again together in haphazard ways becomes eye opening to hear the hit sliced apart with no concern for its natural arrangement. The way your hearing works is questioned or at least that sound you think you knew is all of a sudden surprising. The clicks and abrupt jerky decays are possibly looped over what used to be subtle live bass sounds which were also manipulated after the fact, the whole thing building up layers of beeps in a free form Tortoise composition, just enough organic foundation to keep you guessing but the chops are so obviously not man made like artisinal Velveeta or small batch Kool Aid. "Ornament #7" begins with an ominous lowered grumbling and chiming notes fading in loops like William Basinski. A glitchy repeated morse code clicking way, in a warning signal or desperate communication that reminded me of Boards of Canada. Their subtle moments that works on repetition and the unnatural sounds hint at something dangerous or unsettling. Punctuated by bursts of elements from other spaces, in a huge rumbling airplane hanger for example. All this time you were in the inside the head of the track with headphones but it's been working all around you in a much larger space. Full of cool, calculated glitches, it abruptly end in silence so you can hear the birds and wind outside and appreciate that they aren't trying to undermine everything you've ever heard. Get this from KIKS/GFR Records, 4 pounds plus shipping. This is one of those massive frisbee singles so it will actually make it intact anywhere in the world. Smart move. 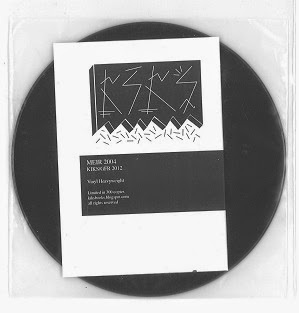 For samples, check out this PDF of KIKS/GFR Records catalog and click on the audio links under the release.